A pair of hapless brothers plot to ensure their inheritance stays in the family in Brothers' Nest, the latest film from director Clayton Jacobson. 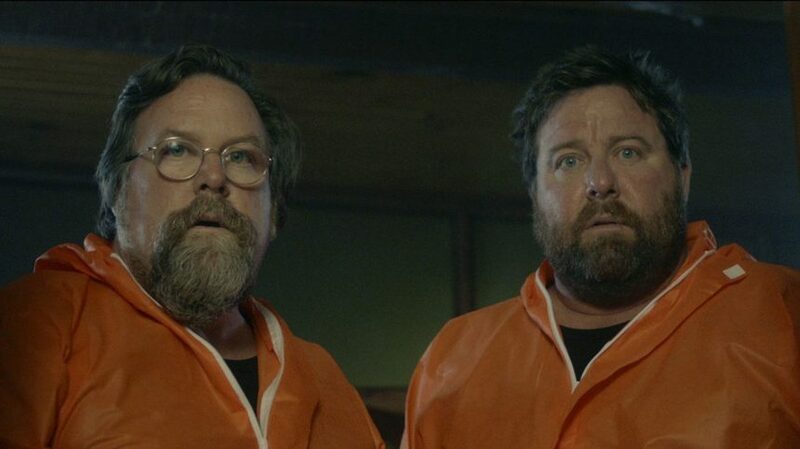 Jeff (Clayton Jacobson) and Terry (Shane Jacobson) are middle-aged brothers who have come up with a plan to ensure that their family home doesn't go to their stepfather when their cancer ridden mother kicks the bucket. They are going to kill him. Unfortunately for them, they have to survive each other first in this black as pitch comedic thriller that was one of my favorite films at this year's festival. The brothers couldn't be more different in their demeanor. Jeff the elder is a meticulous sort who has planned out the murder to the minute to ensure that no evidence remains that would link them to the crime. Terry, or Tez as he is called against his will by his brother, is the emotional one, battling with himself the entire time they are prepping the scene of the crime-to-be about whether or not to go through with it. As they work to get all the pieces in place, their relationship is tested and begins to fall apart, first in rather benign ways, but later in ways that test their allegiance to each other and eventually to themselves. Starring real life brothers Clayton and Shane Jacobson, Brothers' Nest is one of the most engaging black comedies I've seen in several years. The chemistry of the brothers Jacobson feels so real and lived in that it couldn't have come from anything other than a pair of performers who'd spent their lives bouncing off one another. Given that Brothers' Nest is essentially a two-hander until the final reel, that chemistry is vital to making the film work, and it goes over like gangbusters. Jeff's overbearing and commanding nature plays against Tez's sheepish manner beautifully, giving both characters room to flesh out their own arcs in which the tables begin to turn. What begins as a clear motive to keep the family home in the family, as expressed by Jeff over and over again when Tez gets twitchy about committing murder, morphs into something less dependent on filial devotion and more a result of personal greed. Skeletons begin to crawl out of each brother's closets, complicating the plot and bringing the audience into the scheme in an ingenious way. As meticulous as Jeff's murder checklist is - ingredients to the plot are plainly listed on a yellow note pad, complete with the time at which they are to be executed - it's the way it all goes spectacularly pear-shaped that gives Brothers' Nest the kick it needs to turn it from a black family drama into a thriller worthy of notice. Clayton Jacobson doesn't shy away from the violence that the entire film has been building toward, making sure that the audience feels the brutality of the acts in the same way as the characters. It's one thing to plan a murder, it's something different altogether to commit the act. Director Jacobson's depiction of the collapse of this already tenuous brotherly bond is marvelous. It's very easy to maintain genial relations with family when you don't have to deal with them on a regular basis, however, when it comes down to doing the dirty work, the seams start to show pretty quickly. Brothers' Nest takes a simple plot and weaves in these very relatable challenges that everyone faces on some level in a brilliant and unexpected way, and what looks like a black comedy has some surprising emotional stakes that don't show until the final few minutes. As everything falls apart for Jeff and Tez, the audience is treated to a spectacular crescendo of mishaps that takes the decaying brothers' relationship and drop it off a cliff. Reminiscent of the best of the Coens' work, Brothers' Nest is a future classic in the making.